A new species of cricket has been caught on camera - and its bizarre behaviour has surprised scientists. Far from living up to the cricket's plant-destroying reputation, this species lends a helping hand to flora by acting as a pollinator. Scientists say this is the first time a cricket has been spotted pollinating a flower - in this case, an orchid. A study of the nocturnal insect, which was found on the island of Reunion, has been published in the Annals of Botany. The creature has yet to be given a scientific name, but it belongs to the Glomeremus genus of crickets, which are also known as raspy crickets. 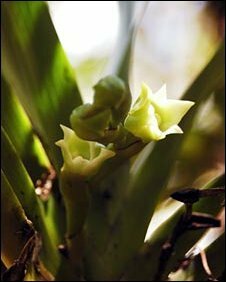 The insect was spotted by researchers who were attempting to find out how a species of orchid called Angraecum cadetii was being pollinated. This green-white flower is closely related to the comet orchid, which is found in Madagascar. Naturalist Charles Darwin predicted that because the comet orchid has an incredibly long nectar spur (the part of the plant that holds the sweet nectar), it would be pollinated by an insect with an equally long tongue. It was later found that the nocturnal hawk moth with a proboscis measuring approximately 35cm (14in) in length was the pollinator. 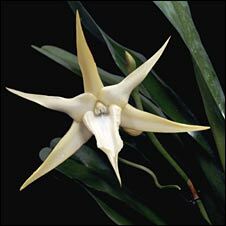 However on Reunion, which is situated in the Indian Ocean, hawk moths are very rare and the Angraecum cadetii orchid has a shorter nectar spur than its Madagascan relative, so scientists suspected something else was pollinating it. 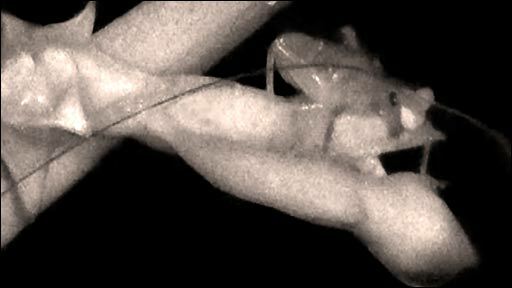 To solve this mystery, scientists trained a night-vision camera on the flower. Claire Micheneau, from the University of Reunion, who carried out the research with the UK's Royal Botanical Gardens (RBG), Kew, and the University of Strasbourg, France, told BBC News: "We were very surprised when we saw a cricket. "Crickets usually eat flowers, not pollinate them." 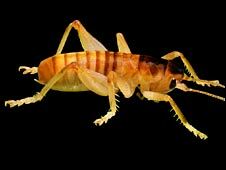 The film shows a wingless cricket, which measures about 2-3cm (0.8-1.2in) in length and has extremely long antennae. It crawls onto the flower and pokes its head in to the nectar spur to drink up the sweet liquid before leaving with lumps of pollen attached to its head and visiting other flowers on the orchid. Dr Micheneau said: "This is the first time that we have seen flowers being regularly pollinated by a cricket." The team added that the cricket seemed to be the only pollinator present on the flower and that it was extremely effective at doing the job, possibly thanks to the fact that the size of its head matched the size of the nectar opening on the orchid. Further analysis of the cricket revealed that the species was new to science. Professor Mark Chase, director of the Jodrell Laboratory at RBG Kew, said: "It really is a completely bizarre thing for a cricket to do and it is strange for an orchid to become adapted to that kind of pollinator." The team added that the cricket was also unusual in other ways. Professor Chase explained: "They do some fairly sophisticated things by cricket standards. "Most crickets just stop eating and find a place to hide away during the daytime and it's usually a different place every time. But this one finds its way back to its own specific nest. "And that is a key thing for being able to re-locate the orchids, because they go back to those several times, and it is that capacity to keep track of where they are in their environment that allows them to do this sort of navigation." The research team is now looking at how the relationship may have come about. Professor Chase said: "Orchids rarely co-evolve with their pollinators, mostly it is a case of the orchid adapting to an insect or animal that already exists that may visit flowers of other plants, and the orchids sort of tap into that."